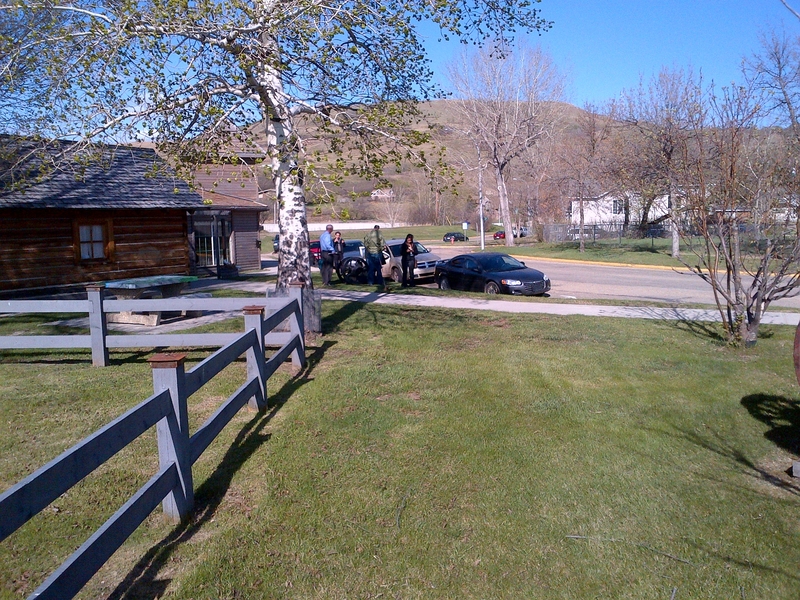 The Alberta Historical Resources Foundation held a board meeting in Peace River on May 11 and 12. 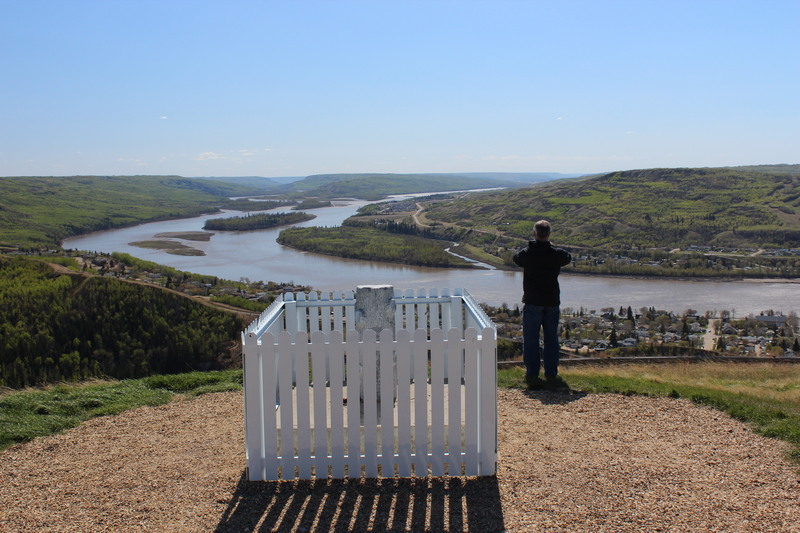 The staff of the Peace River Museum, Archives and Mackenzie Centre organized a tour of the area, allowing the board members to experience first-hand a few of the community’s historic places. We began at the Northern Alberta Railway Station in Peace River. The wooden railway station still sits on its original sitting, adjacent to the railway tracks. The station was constructed in 1916 just as the railway connecting Peace River to southern Alberta was finished. The Northern Alberta Railway Company’s new line linked Peace River to the Canadian railway system and its opening increased the flow of people and goods coming into the region. The station is divided into rooms for passengers, freight and staff. Historical artifacts are displayed throughout the building, and many relate to the operation of the railway station. The station was a communications hub; mail and freight first moved through here and later it housed the telegraph and telephone switching equipment. The building has been beautifully restored and is used by Peace River’s Chamber of Commerce as a visitor centre for the community. It’s fitting that the building has been repurposed as a visitor information centre. The building will continue to welcome visitors to Peace River. 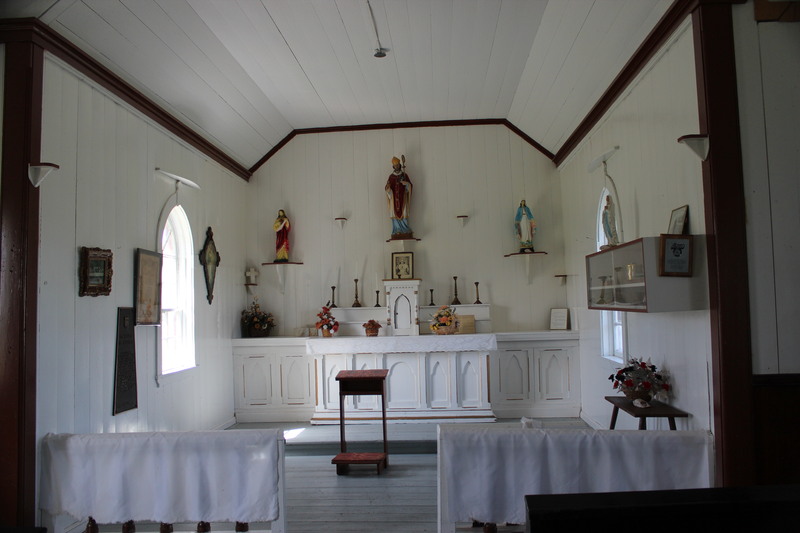 It was designated as a Provincial Historic Resource in 1988. 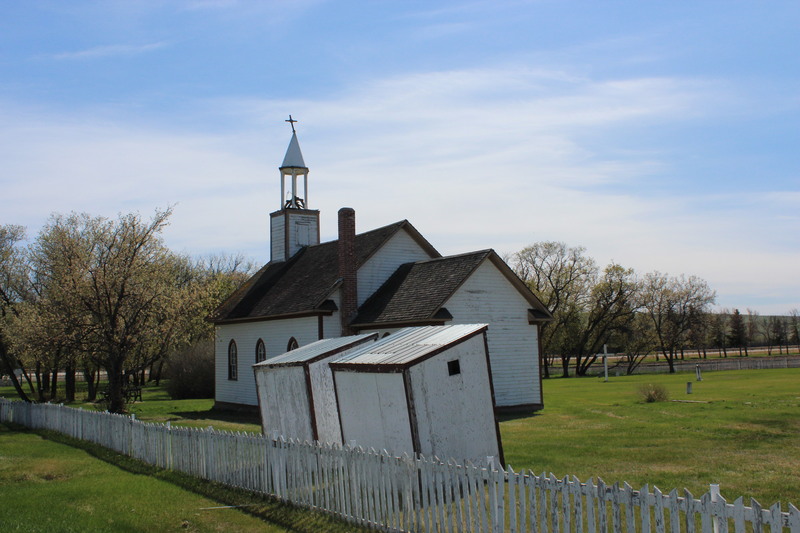 You can learn more about the station by checking out its entry on the Alberta Register of Historic Places. Later, we drove down the Shaftesbury Trail and arrived at the Shaftesbury Ferry. 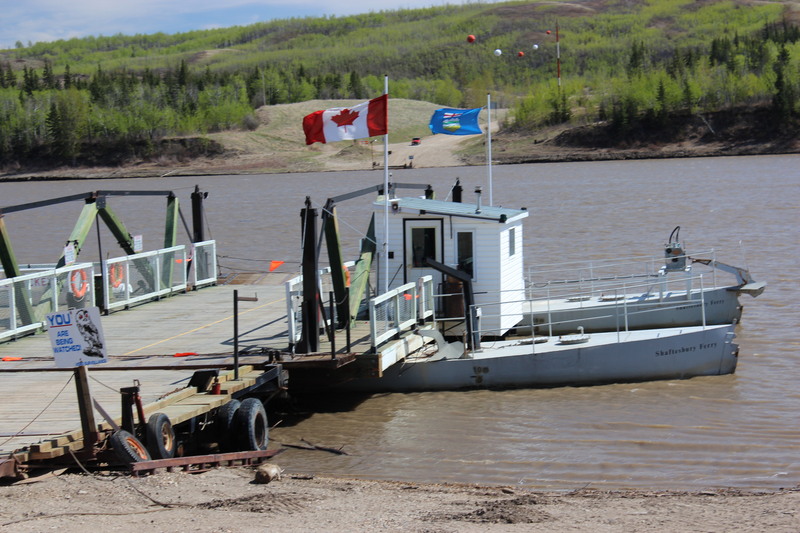 The ferry has been transporting people, vehicles and farm equipment over the Peace River for over 50 years. The confluence of the Peace and Smoky rivers is just south of the town. Without the ferry travelers arriving from south of the confluence would have needed to travel an extra 100 kilometers simply to get to Peace River. This would have been unworkable for a famer to haul grain or produce to market. Everett Blakely, a local resident, built a ferry privately in 1951. Mr. Blakely wanted to acquire farmland near the banks of the Peace south of its confluence with the Smoky and needed a ferry to access it. Mr. Blakely allowed his neighbors the use of the ferry and it quickly became indispensible. In 1977 the provincial government established a public ferry service on this location. Seeing the ferry moored on the riverbank reminded me that Alberta transportation infrastructure is not just roads and our geography is more than just the plains. A hundred years ago, barges steamed up and down the Peace River loaded with goods and people. Both David Thompson and Sir Alexander Mackenzie both visited the area while exploring the northwest. After visiting the ferry, we headed back towards Peace River. 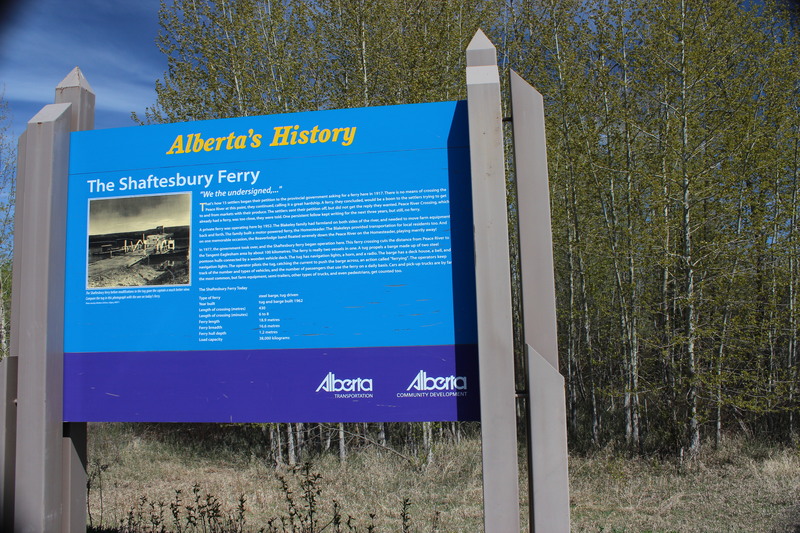 Stay tuned for Part II, to learn about other sites visited by the Alberta Historical Resources Foundation board.